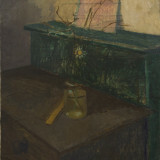 Euan Uglow, 1932-2000, Daisy, 1976. Oil on canvas, 35 x 25.4 cm, 13 3/4 x 10 in. William Coldstream | Euan Uglow: Daisies and Nudes has been chosen as a London exhibitions highlight in the January 2017 issue of World of Interiors magazine. Sitting alongside the National Gallery and the V&A, amongst others, Piano Nobile's latest exhibition features in the magazine's 'Diary' section, with works described as 'quiet, methodical' and 'rigorously observed'. A PDF of the article is available to download at the bottom of the page. 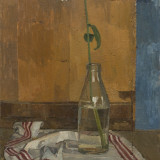 William Coldstream | Euan Uglow: Daisies and Nudes presents paintings and drawings by William Coldstream (1908-1987) and Euan Uglow (1932-2000), the first exhibition dedicated to a unique relationship at the heart of post-war figurative painting in Britain. For more information, please see the exhibition page.